Thomas Burr Williams was a veteran of the Civil war, the was National Chief of Staff of the Grand Army and Assistant Adjutant General of Kansas G.A.R. and he was the oldest living resident of Chapman, Kansas at the time of his death. His father, Lloyd Hubble Williams, died when Tom was 7 years old. In March of 1864 at age 13 he enlisted in Company H, 140 Illinois Volunteers and was rejected because he was too small. The next year at age 14 on March 17, 1865 he again enlisted in Col. I, 15th Illinois Volunteer Infantry and was sent to Chicago. Besides himself he had four brothers and a step-father in the war. All the brothers returned by the stepfather didn't. He received his honorable discharge September 19, 1865 at Springfield, Illinois. He joined the Grand Army of the Republic in Oct. 1884. He was drafted into the office of Junior Vice Commander in 1937, advancing to the Department Commander in 1939, the highest office the department has. In February 1941 he was appointed Chief of Staff on the GAR. Thomas' nickname was "Bub". In his lifetime he resided in Illinois, Iowa, Wisconsin, Ohio, Montana, Minnesota and Kansas. From his Commander G.A.R. of Kansas 1939-1940 pamphlet: Thomas Burr Williams was born May 8, 1950 in Plainfield, Will County, Illinois. He was one of a family of twelve children, of Lloyd Hubble Williams and wife. At the age of seven his father passed away. In March of 1864, at the age of 13, he enlisted in Co. H, 140 Illinois Volunteers and went to Springfield, Illinois, where he was rejected because he was too small. The next year, then 14, in March he again enlisted in Co. I, 15th Illinois Volunteer Infantry, and was sent to Chicago, Illinois. Besides himself he had four brothers and a step-father in the war. All the brothers returned but the step-father did not. He received his honorable discharge September 17, 1865 at Springfield, Illinois and returned to his mother at Roschell, Illinois. He was united in marriage to Nancy Ellen Murphy, August 4, 1872 at Grinell, Iowa. To this union were born eight children, five daughters and three sons. Three daughters and two sons are now living. He was united with the Christian Church in early manhood. He joined the Independent Order of Odd Fellows in Minnesota in 1878. He received his 32 of Masonry in Kansas in 1930. He is the only surviving member of the Chapman Post No. 362. Was elected Senior Vice Commander of G.A.R. in 1938, and Commander of G.A.R. in 1939. He attended the 75th Anniversary of the G.A.R. at Gettysburg. Was Representative to Des Moines, Iowa in 1938, and to Pittsburgh, Pennsylvania in 1939. Article from the Chapman, Kansas newspaper, May 10, 1922: The impossible has been accomplished. A successful surprise party was engineered and carried out Monday of this week by the local lodges of the Odd Fellows and the Rebekas the occasion being the 72nd anniversary of the birth of T. Born: Williams. Some days ago Miss Beulah Williams conceived the idea of surprising her father and on her invitation about a hundred of the members of the two orders gathered at the Talbert hall and Uncle Tom was called on the phone and told to come immediately as there was a special called meeting and his presence was needed. Without stopping to change from his work clothes he came to the hall. He was required to work his way into the hall just as though a meeting was in progress. His face was sturdy when he realized that the joke was on him. A march around the room to the strains of "Marching Through Georgia" and Mr. Williams and wife were seated facing an enormous cake with the requisite 72 candles. Chas. F. Deem made a short speech recounting some of the happenings of the life of Uncle Tom and presented him a fine watch charm, the gift from his friends of both orders. Uncle Tom spoke a few works of appreciation but his main thought and wonder seemed to be, how in the world did they manage to get this off and keep it a secret? A lunch of ice cream and cake was served after which all joined in games and some of the old folk dances in which all enjoyed themselves to the fullest extent. Uncle Tom has been a member of the Odd Fellows since in 1878 and of the Rebekas since 1879 and has filled every chair in the sub-ordinate lodge. His philosophy as he expressed is is "One is only as old as they feel" and said that he intended to live thirty or more years yet. May his shadow never grow less and his smile only grow broader and more frequent, if possible. Thomas Burr Williams obituary: Thomas Burr Williams was born May 8, 1950 in Plainfield, Will County, Illinois. He was one of a family of twelve children, of Lloyd Hubble Williams and his wife. At the age of seven his father passed away. In March of 1864, at the age of 13, he enlisted in Co. H, 140 Illinois Volunteers and went to Springfield, Illinois, where he was rejected because he was too small. The next year, then 14, in March he again enlisted in Co. I, 15th Illinois Volunteer Infantry, and was sent to Chicago, Illinois. Besides himself he had four brothers and a step-father in the war. all the brothers returned but the step-father did not. He received his honorable discharge September 17, 1865 at Springfield, Illinois and returned to his mother at Roschell, Illinois. He was united in marriage to Nancy Ellen Murphy, August 4, 1872, at Grinell, Iowa. To this union were born eight children, five daughters and three sons. Three daughters and two sons are now living. He was united with the Christian Church in early manhood. He joined the Independent Order of Odd Fellows in Minnesota in 1878. 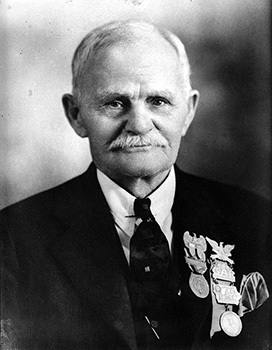 He received his 32 of Masonry in Kansas in 1930. He is the only surviving member of the Chapman Post No. 362. Was elected Senior Vice Commander of the G.A.R. in 1939. He attended the 75th Anniversary of the G.A.R. at Gettysburg. Was Representative to Des Moines, Iowa in 1938, and to Pittsburgh, Pennsylvania in 1939.